This Doulton Bunnykins Bowl was a gift to my Aunt on the Birth of her son over 20yrs ago. 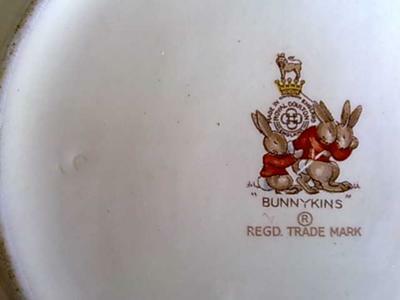 Photo showing the Doulton Marks on my Bunnykins Bowl with the artist mark on the far left. 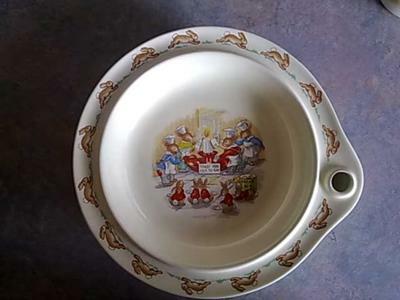 The bowl is minus the lid, and the Bunnykins decoration is by Royal Doulton. Looking into it, it may have been made earlier however we can’t establish too much information as details are so far spread out nothing makes much sense to us newbies. We’ve established the stamp is from Royal Doulton 1959-1975 earthenware. As for decoration on the Bunnykins bowl, don’t know what it’s called. There is also a mark we’ve been unable to identify it looks close to the artist mark “M Unwin” but unsure. If there is anyone out there who can help us we’d be forever grateful! Your Bunnykins hot water bowl is titled “Toast for tea today”. The cover is indeed missing, as is also a metal topped cork stopper. I use mine as a butter dish, on warm days filled with iced water to prevent melting. I just bought a Bunnykins bowl at auction. It has a lid with three seperate pictures on it and a picture on the inside of the bowl. I’ve still yet to date it. I think it’s got something to do with the numbers next to the Royal Doulton mark. I have an almost identical Bunnykins bowl, but with a different picture. Signed by Barbara Vernon. Mine is latest 1953, which would fit with when my mother would have bought it. The back stamp helps. I will tell you more when and if I find out any more. Thank you David for your reply, it was most helpful and precise. The artist mark I was refering to is to the middle left side of the Bunnykins bowl stamp. Looks sort of like a dent you could say, maybe it’s just that and not an Artist mark after all! Once Again Thank you for your help dating this piece. 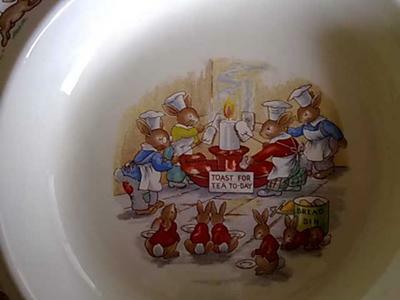 Your Bunnykins bowl is called (TOAST FOR TEA TODAY) and was issued by Royal Doulton between 1954-1967. Royal Doulton stopped making your style of bowl in 1959. I cant see the other marks you are talking about.